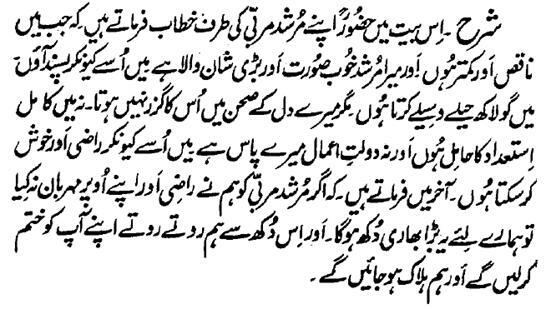 Here Hazrat Sultan Bahu Rahmatu-Allahe Ta-aala Alaihe addresses to the honor of his Mentor Murshid that 'when I am Imperfect and lowly person and my Murshid is very beautiful and of high esteem and magnificence, then how will I be liked by him? I, though, try many (innocent) gimmicks and wiles but he is not going to pass through my courtyard. I neither have the Kaamil Ability nor do I have wealth of good deeds. How can I make him pleased and happy on me? At the end, he says that 'I we could not turn our Mentor Murshid pleased and kind on us, it will be a big grief for us and we will weep and weep in this grief till we finish our self and die at the end.